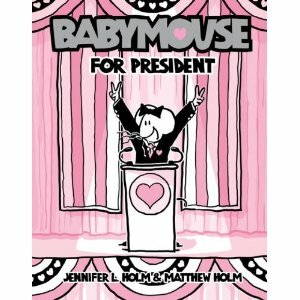 Babymouse for President by Jennifer L. Holm & Matthew Holm. Random House, 2012. Currently available. Face Value: Babymouse is doing The Nixon. Babymouse is rocking that podium. There are just no words that can adequately describe how hilarious this is. Among Babymouse covers, this lives up to the standard of excellence. Does it break the slate? Yeah! Babymouse starts a campaign for student council president – and although she may have misguided intentions when she starts, she figures out the real purpose of public service and takes a stand against lunchroom injustice. Yes, this book is lighthearted and approaches the topic humorously, but it’s still great to see Babymouse (among other female characters) running for office and inspiring young readers to do the same. Who would we give it to? Do you know any kids in the elementary grades who complain about school lunch or too short recesses? Babymouse for President can show them ways to work for change in a proactive, productive way. Review: Babymouse is a bit of a complainer. (I don’t mean to insult Babymouse. She just complains about things sometimes. So do I.) She tends to be dissatisfied with things – nasty hot lunch food, homework, anything related to math. In Babymouse for President, a history lesson about Abraham Lincoln sparks Babymouse to run for student council president. At first, her interest in running for office is more about the potential popularity she will gain from being president. Babymouse is power hungry and she dreams of using the presidential role to turn her middle school into the perfect, homework-free environment. Thankfully, Babymouse has some friends who are a bit more realistic than she is. One of them volunteers to run her campaign. As soon as Babymouse realizes that campaigning is a lot of work…she starts to regret the impulsiveness that led her to declare herself a candidate. I like Babymouse so much as a character because we have a lot of similarities. We both dream big, and then get cranky when the details bog us down and seem harder than we imagined. To Babymouse’s credit, she doesn’t quit the campaign. When it’s time for the debate, Babymouse chokes. Her responses are uninspiring and it looks like the other candidates are going to trounce her. But she comes out at the end with a brilliant, inspired speech – one that she wouldn’t have been able to give if she didn’t have a true passion for the democratic process. Babymouse learns some harsh realities in this book. She feels like she’s selling her soul throughout the campaign because she has to promise lots of things to lots of people in order to get their votes. I appreciate that Holm & Holm have imbued Babyouse with a conscience. As an educator, I often feel that we do not spend enough time talking with young people about ethics. I’m not interested in teaching a certain moral system, but I am interested in having conversations about how individuals decide what is right and what is wrong, and why we sometimes arrive at different decisions. Babymouse for President is definitely a “fun” book more than a philosophical text, but I think it could provoke some really great dinner table or classroom discussions. Why does Babymouse feel so uneasy about campaigning? When do you think real-life politicians might feel the same way? How would you handle the pressure if you ever ran for office? Call me crazy, but Babymouse for President could be an excellent classroom read for teachers who are doing presidential units or teaching the democratic process. And let’s be real – any teacher who assigns a Babymouse book is pretty much a rock star. This entry was posted in Graphic Novels, Middle Grade, Reviews, Theme Week and tagged Babymouse, Campaigns, Elections, Ethics, Graphic Novels, Jennifer Holm, Student Council, Theme Week. Bookmark the permalink.